The headlines above were taken from internet articles and local newspapers throughout our communities within just the past few days. If there’s one course at Bear Arms we would encourage all women to take, it would be this one; Women’s Self-Defense – Violence Prevention. It’s that important. Whether you’re 16 years of age or 86, this class will teach you a wide array of self-defense techniques and strategies to help protect you from assault, car jackings, robbery, home invasions and other serious crimes. No matter what your occupation — a lawyer, doctor, bartender, college student, realtor, photographer, a sales clerk, judge, waitress, teacher, an artist — or a full-time mom, this is a MUST TAKE course where women can benefit greatly. Crime doesn’t discriminate. Don’t become a victim — and don’t be foolish…WOMEN ARE EASY TARGETS in the eyes of many criminals. But you can gain the upper hand with this comprehensive workshop that will teach you how to protect yourself — and maybe even save your life — or a life of a loved one. It’s that important. Participants will learn information about the psychology of attackers, awareness and avoidance strategies, verbal de-escalation strategies, pre-contact cues and physical strategies. Experience SAFE attack scenarios with instructor wearing protective gear! * As reported by areavibes. 18,000 local law enforcement agencies in the U.S. Date(s) & Update Frequency: Reflects 2016 calendar year; released from FBI in Sept. 2017 (latest available). Methodology: Our nationwide meta-analysis overcomes the issues inherent in any crime database, including non-reporting and reporting errors. You don’t have to be a firearms enthusiast to take our class. 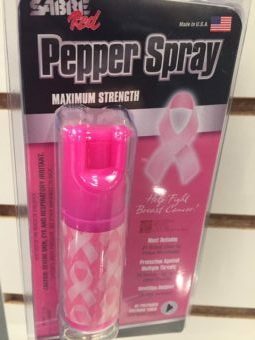 Pepper spray is just one of several non-lethal “weapons” that can stop criminals in their tracks. It’s included free with your class! And we’ll show you how to use it. Interviewer Garrett Mc Conley takes you through an attemtped armed robbery at a local, Mequon Jewelry store.